The middle-aged mafia descended on youthful Camden town last night to see one of America’s finest singer-songwriters take her audience on a soulful journey down memory lane. Celebrating over 20 years in the industry, Chapman emerged to a rapturous Roundhouse welcome, before embarking on her emotional back catalogue of hits with love, defiance, anger and protest at the heart of her set. Talking about a Revolution, Fast Car and The Promise finally managed to stir a fairly tepid crowd that offered little in the way of swaying – never mind dancing – although they could be forgiven for offering little during songs from her latest, slightly Christian-driven, album, Our Bright Future, which took everyone down the redemption route for one hail Mary too many. That said, at a time when the market is oversaturated with the reforming of overrated bands from the 80s, Chapman sounds as poetic and edgy as ever and provided a timely reminder that the decade produced more than just big hair, big shoulder pads and big egos. Venue : Roundouse, Chalk Farm Road, London, NW1, United Kingdom. Setlist for the 24th at Roundhouse. 3. Baby, can I hold you. 10. I did it all. 14. Shes Got her Ticket. 16. Give me one reason. Excellent, thank you very much Steven! Hey everyone. I had a fantastic time at the concert (June 24th) last night and I thought I would share a bit of info with you. 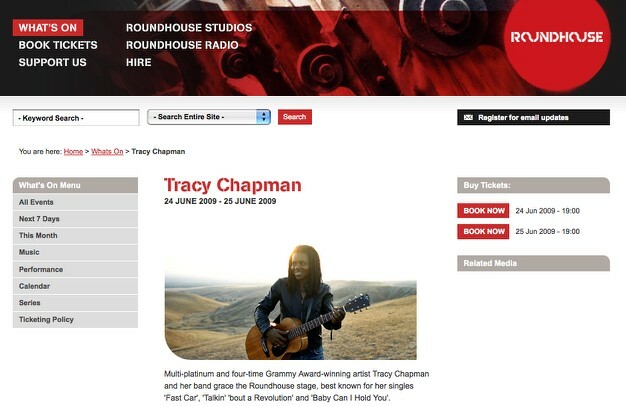 The Roundhouse was like a fortress so no chance to meet Tracy this time. I was angry because we were at the front of the queue to go into the standing area and a stewart told us we had the wrong ticket, when we didn’t! So we missed our space. We demanded that the woman take us to our friend who was futher forward but then I had trouble with a REALLY big man in front of me. 2. Telling Stories – Well this gave me hope that the setlist will be exciting. 6. 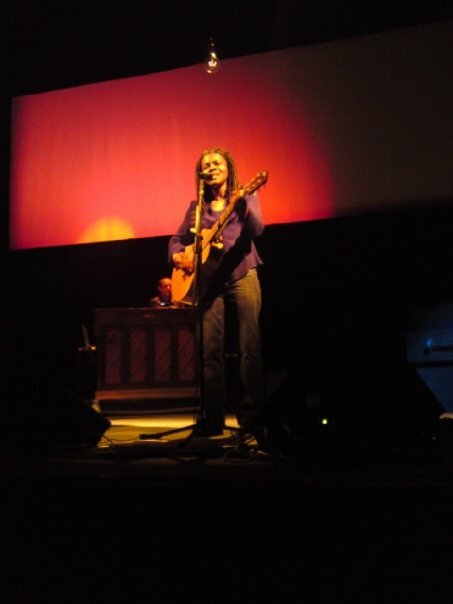 Another Sun – A Favorite of mine from the Let It Rain album, Tracy sat on her percussion box and sang beautifully. A Highlight for me! 7. Spring – Nice Suprise, I’m never too sure about the LP recording but I enjoyed this alot! 8. Save Us All – Recieved a great reception. 10. I Did It All – Tracy gave us an explination about the song and suggested an old woman in lingere! GROSS! 18. The Promise – Still a timeless classic which should have been a UK hit imo, great song to finish with. A great show In London, Tracy thanked us for the weather and explained that yesterday (Tue 23rd June) she had a day out in Hyde Park. (Missed Opportunity, if only we were phsycic!). I had the pleasure of meeting a long time online friend and Tracy Chapman fan, Ben! Who has been posting on the forums for years now. This was great. The “Money” cover and the “Give Me One Reason” reprise proved to me Tracy’s voice can do loud and powerful just as well as the slow and soothing! So for the next album please please please get angry. 5) She blew me away: I knew she’d be good. 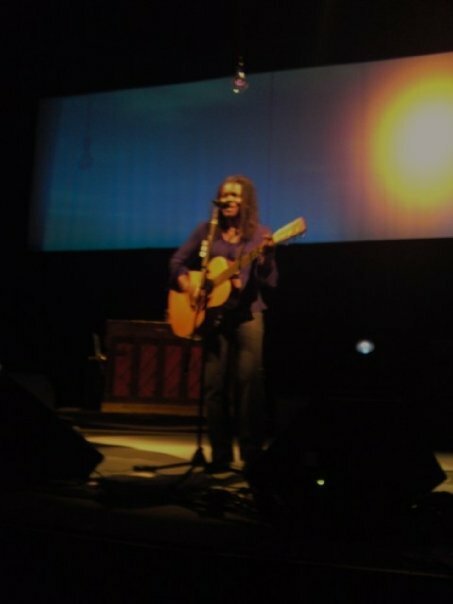 It’s Tracy Chapman – living legend. However, I was slightly concerned she’d just play her new album and refuse to perform any of the old classics. I was ecstatic to be proved wrong. 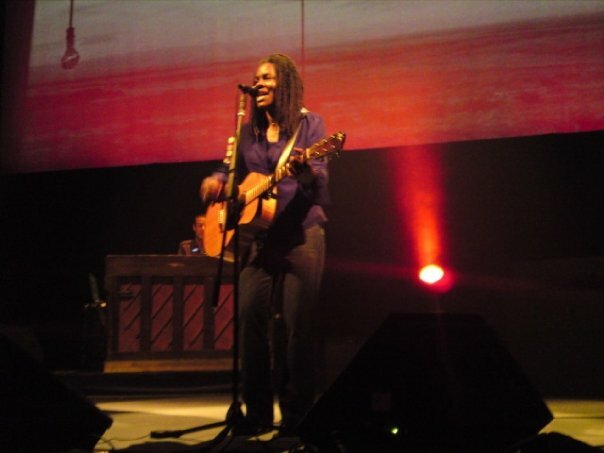 She did play her new album, which is fine because it’s brilliant, but she also played nearly the entire Tracy Chapman – Collection album which had the whole crowd shouting, chanting, dancing and singing for two hours solid. If the touts outside The Roundhouse weren’t quite so aggressive (and I didn’t have a gig) I’d get another ticket and go back tonight. Instead, I’m going to be grateful for the fact I’ve seen her at all and will obsessively listen to her music on my iPod instead. I recommend anyone else to go along tonight because it’s a night you’ll remember for the rest of your life. Tracy was fantastic. It was my first time seeing her live and it is definitely one of the best gigs I’ve been at. Wonderful night. Sound quality in that venue seemed excellent to me. Good views, good crowd and relaxed yet powerful set. Loved this show and just googled it 6 years later in the hope of revisiting those memories. Was fortunate to get TCs very own water bottle after the show!